We are a leading Manufacturer of stitched tropicana quit from Jaipur, India. We offer Stitched Tropicana Quit that are crafted using various fabric pieces obtained from multiple saris. We collect thousands of such sari fabric pieces and create marvelous designs out of them. 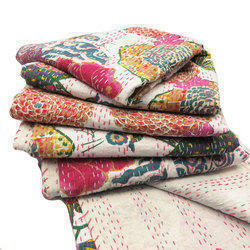 They are lightweight blankets made applying Kantha stitching techniques. These blankets are 100% cotton. They are warm and aesthetically appealing.